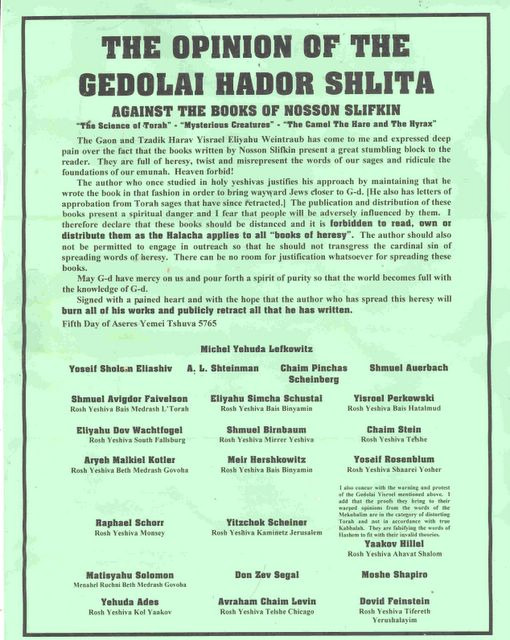 In 2004-2005, three of Rabbi Slifkin's books were banned as heretical by a large group of distinguished rabbinic authorities from the Charedi (ultra-Orthodox) community. 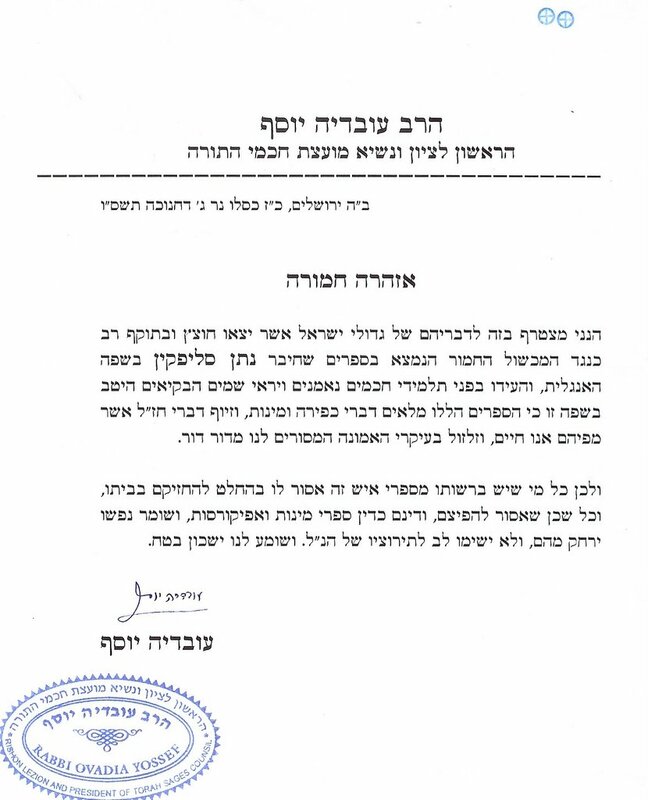 The ban was rejected by Rabbi Slifkin and his mentors, and prompted a widespread backlash. This webpage links to a collection of resources concerning this controversial ban. 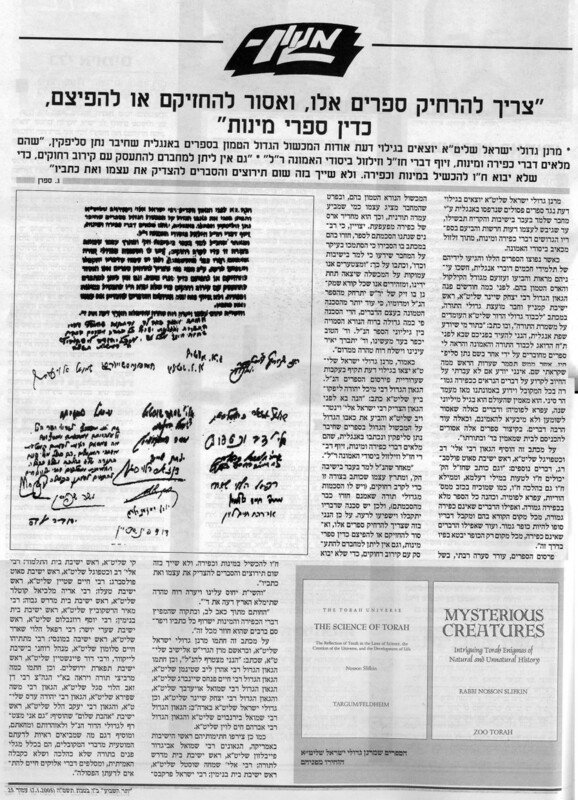 "Ma'amar Mevo HaShemesh" - A booklet (in Hebrew) by Rabbi Pinchas David Weberman, editor of Sefer Hatekhuna of R Hayim Vital, which "proves" that heliocentrism is heresy. This is not directly related to the ban on the books, but it is highly relevant to the issues being discussed. 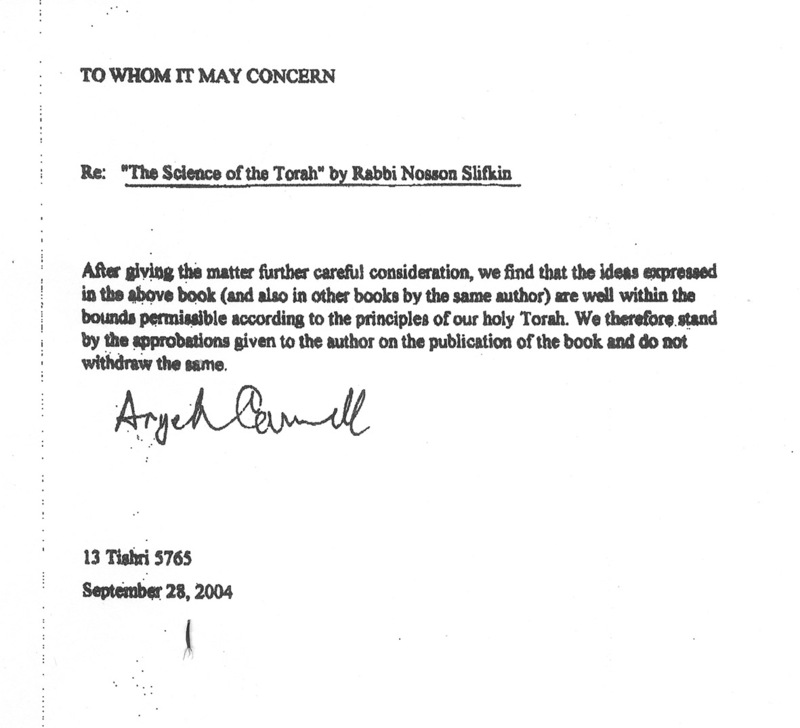 The author's argument is that there is no traditional basis for this model and that the consensus of the Acharonim was to reject it as heresy. In this he is quite correct; nevertheless, the heliocentric model of the solar system is valid. B'Toraso Shel R' Gedaliah - the complete book of Rabbi Gedaliah Nadel's teachings, which include his discussion (and acceptance) of the antiquity of the universe and evolution. 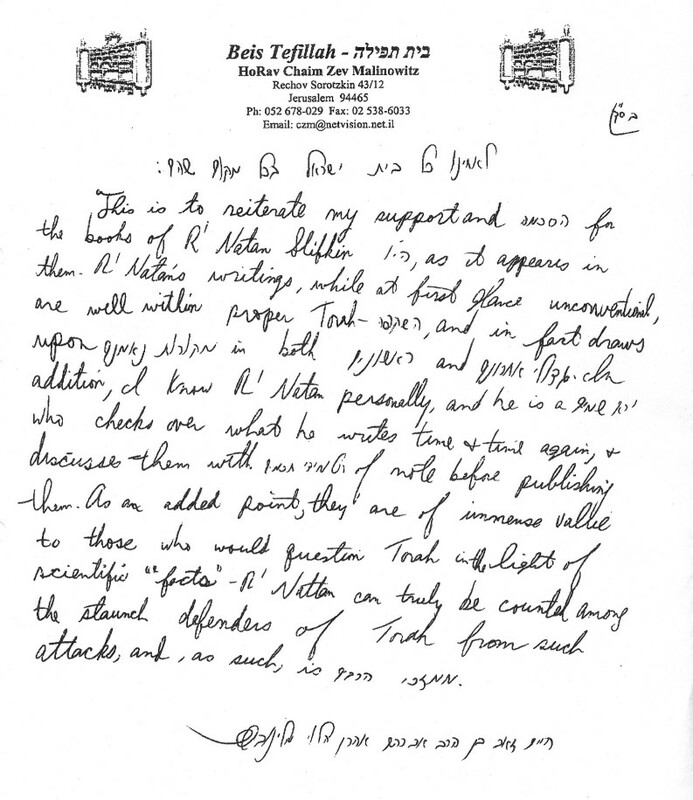 4.2 meg PDF file. 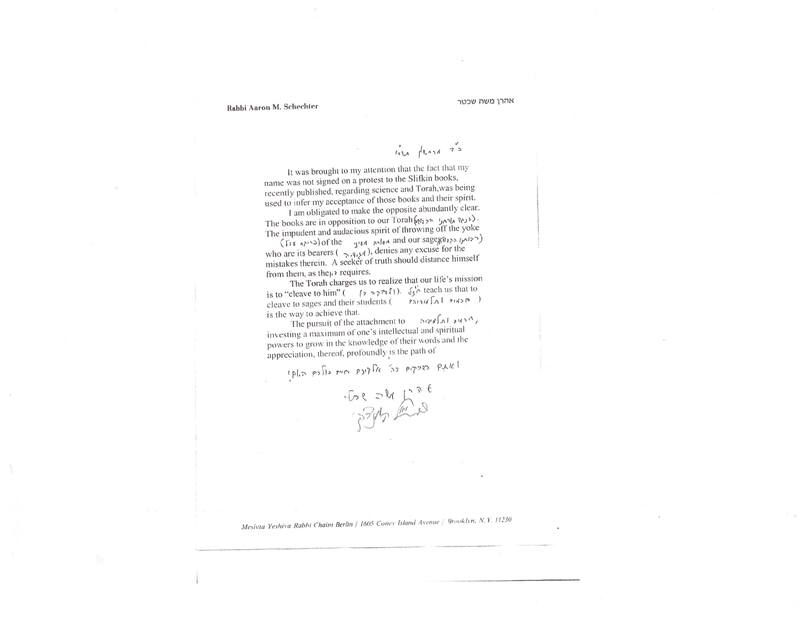 Rabbi Moshe Sternbuch's letter of condemnation in English and in the original Hebrew, and a response by Rabbi Gil Student. 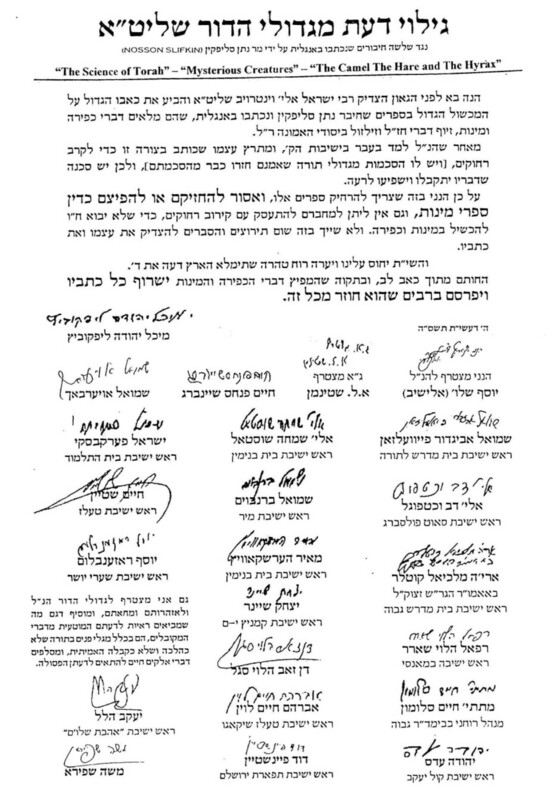 EJF's Conversion Requirements - an anonymous report on how a new organization, Eternal Jewish Family, which seeks to place all conversion to Judaism under its authority, wishes to disqualify those who accept modern cosmology from converting to Judaism and from serving on a conversion Beis Din. The Wall Street Journal: Is Darwin Kosher?